The stories hint at historical origins, but there are no footnotes; no sources. Each one simply a title and a scant few paragraphs. Representative titles of the many, many stories include: Origin of Beauty, Brief History of Beer, Osiris, The Other Pyramid, Amazons, Homer, Jokes, Plagues, Bestiary, Origin of the Elevator, Holy Water, Mozart, Origin of Ecology, Longest Street, Tesla, Origin of Jazz, Road Rage, Black Voice, Father of the Computer. The collection reminds me of several favorite works of experimental, imaginatively rich fiction: Calvino’s Invisible Cities; Zachary Mason’s The Lost Books of the Odyssey; some kind of strange Borgesian encyclopedia. This “phantasmagoric mosaic of humanity” is quite a creative idea for a book! 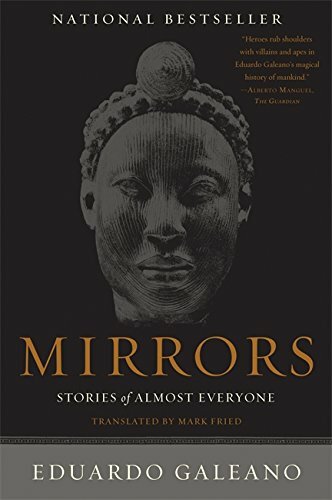 A very cool and ambitious macroscopic “history” of humanity, our accomplishments and quirks and sides both good and evil, through a dazzlingly crafted lens.